People seem to come out of the woodwork when there is the story about an error coin being worth a lot of money. Most have folders or albums left behind by long passed loved ones that they have stored in a draw for sentimental reasons. They do not have the passion of the relative for collecting, but they still have the folders. Since the news reports about the discovery of two 1943 Lincoln wheat cents struck on copper planchets hit the news, I have received a few inquiries as to whether they have a coin that could be worth tens- or hundreds-of-thousands-of-dollars. All are disappointed when they find out that grandpa’s old album may not be worth more than $50.00 if that much. Those of us who have been around this hobby for a while know that many factors go into pricing coins including supply and demand, condition, and other market forces. The considerations are so varied, that I wrote a two-part series on “How Coins are Priced” (links: Part I and Part II) that is still relevant. The 1943 copper Lincoln cent is known as an off-metal error. It probably happened when the U.S. Mint started to strike the 1943 Steel cents and a few copper planchets were probably still stuck in the machine. According to Coin World, there have been 12 reported 1943 copper cents. Now that the coin has been reported in the mainstream media, be careful about buying counterfeits coins. Sources report that would-be fraudsters are either taking the abundant supply of steel cents at a cost of 50-cents to $2 each and plating them with copper. This type of counterfeit is easy to detect using a magnet. Copper is not magnetic and will not react to a magnet. Another trick they try is to alter the “8” on a 1948 Lincoln cent to make it look like a three. If you carefully study the style used on the “3” and the “8” you will see that they are very different shapes on the coins. Also, if you look at the date under magnification, you could see the tooling marks. This is where carrying a 10x loupe is beneficial. Otherwise, make sure the coin is encapsulated by a reputable grading service and that you check the serial numbers against the grading service’s database. 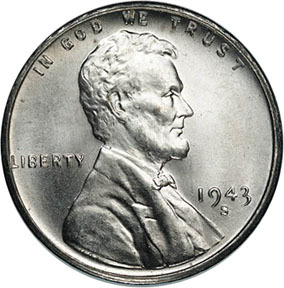 While it is nice to have the attention, please do not be disappointed when I tell you that the rusting 1943 steel cent is probably worth about 25-cents or that reprocessed set may be worth one- or two-dollars. 1943 copper Lincoln Cent courtesy of CoinTrackers. 1943 Steel Cent courtesy of the U.S. Mint. Image showing the diagnostics of an altered 1943 date courtesy of The Spruce.